Artist E.J. 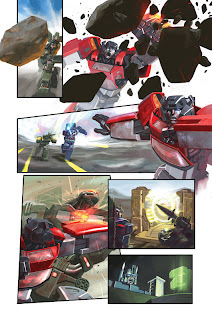 Su was there at the start of our big "-tion" storyline that we kicked off in October 2005, so it's only right that he should handle the art chores on the final chapter in the Revelations saga, TF SPOTLIGHT: SIDESWIPE. The best part of this is the fact that he's doing full art and colors on the book, for the first time ever. Here's his first three pages, to give some indication of what the book will be. Nice! Very Nice! Thanks Chris! Now that is some of the best art I've seen on an IDW TF book. I doff my cap to Mr Su! Oh wow - this is going to be something special! you know it!!! love that EJ's getting to do his own interior colouring, already looks freakin awesome!!! thanks for the preview Chris! I can't believe what I'm seeing! Can we clone Mr. Su so he can do every TF book? Pencils, Inks, and Colors E.J. Su . . .
"...so it's only right that he should handle the art chores on the final chapter in the Revelations saga..."
I'm probably reading too much into this, but I hope that doesn't mean no more TF work from Su after this. Dear IDW, can every Transformers book look like this from now on?? Can we PLEASE make this the new "gold standard" for the Spotlights? is that straxus i see??? ABSOLUTELY BREATHTAKINGLY BEAUTIFUL! E.J. Su's artwork has always been impressive to me. Now, he adds his touch to the coloring...I am left utterly speechless! I second the vote for this to be "the gold standard". Only, not just for the Spotlights, but for all TF books! Hopefully, Su won't bee leaving the TF books anytime soon. I would have to cry myself to sleep if he did! There's another artist who does work similar to that, very detailed, almost three dimensional. His name is Chris Vera, he's got a Deviant Art page, under the name Kurisama. If anything, he's ever better then EJ Su, who's art is frankly awesome. "I'm probably reading too much into this, but I hope that doesn't mean no more TF work from Su after this." You are... I definitely want to work with EJ on anything and everything we can get going. This is just the finale of the storyline he and Simon started, that's all I meant. hoho. 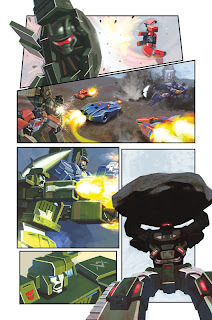 u guys are forgeting mr nick roche yo.. that guys artwork is just it of this world. Who me? Man, I can barely function just drawing the bastiches! If I was to chance it, it'd have to be in the stripped down style I've been using on recent covers, I'd never be able to hit the highs E.J. has with these pages. "You are... I definitely want to work with EJ on anything and everything we can get going. This is just the finale of the storyline he and Simon started, that's all I meant." Awesome. 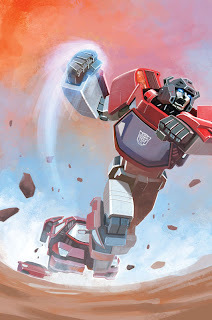 No disrespect to Don, Nick and all the other talented artists, but I think EJ's THE definitive IDW TF artist, and it's great to hear that he'll still be onboard after this. Whoa, a lot's been shown while I was gone!